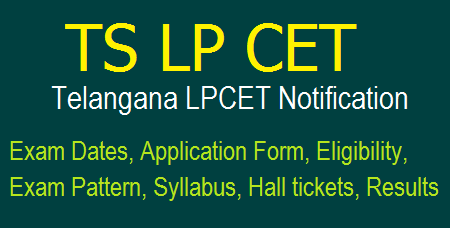 TS LPCET 2018 Notification, Exam Dates, Application Form, Eligibility, Exam Pattern, Syllabus, Admit Cards, Results, Counselling Dates for HPT, TPT, UPT Admissions Apply Online @ tslpcet.cgg.gov.in. TS LPCET 2018 Telangana State Language Pandit Common Entrance Test (TS LPCET) is a common entrance exam conducted by School Education Department, Telangana Government for admissions in government IASE/CTE’s and private language training colleges for one year Language Pandit Training courses (TPT /HPT/ UPT) in all 31 districts of the state. Telangana TSLPCET 2018 Notification will be issued by the DSE Telangana for admission into One year Language Pandit Training Course(LPT) in Govt. IASE /CTE and Private LPT Colleges in Telangana State. LPCET 2018 Exam dates Notification Application Form | LPCET 2018 AP/ TG Notification TPT UPT HPT Application fill up at tslpcet.cgg.gov.in. TS LPCET 2018 Notification, Exam Dates, Application Form, Eligibility, Exam Pattern, Syllabus, Admit Card download here. 1) Candidate should be of Indian Nationality. 2) Candidate should satisfy the status of local and non-local as per the requirement laid down in TS Educational Institutions Order 1974 Regulation of Admission. 3) Candidates should complete 19 years of age. No upper age limit. A graduate degree with optional subject Hindi or Bachelor of Oriental Language Hindi or Praveen of Dakshina Bharat Hindi Prachar Sabha or Vidwan of Hindi Prachara Sabha, Hyderabad or any other equivalent recognized qualification in Hindi (BA Standard) by the Government of Telangana or MA (Hindi). 5) The candidates who have passed the above examination as on the date of submission of application are eligible to appear. 7) For general category candidates qualifying marks shall be 35% of aggregate marks. In case of SC/ST candidates, there shall be no minimum marks. 1) 85% of seats will be reserved for local candidates. 2) 15% of seats will be unreserved seats. 3) The reservation seats for SC/ST/BC/PCP/NCC/SCOUTS & GUIDES/DEFENCE PERSONNEL will be as prescribed by government. 4) Reservations of seats for the Defence Personnel, their children, spouses: For Ex- service en, Defence Personnel, Border Security Force and Central Reserve Police Force residing in Telangana and/or their children/spouses, as per rules. 5) Reservations of seats for NCC/Scouts and Guides/Sports and Games/Physically challenged persons/Defence personnel. Fee can be paid through the payment gateway (online). TS LPCET 2018 Applications will be received through online only. TS LPCET 2018 Application form will be available from May 2018 tentatively. 1) Visit the official website and pay the application fee through payment gateway. 2) Click on “Application Form” and enter the details of fee payment. 3) Proceed to Application form and fill the personal and academic details. 4) Upload the photograph and signature. 5) Submit the application and take a printout for future reference. 4) Subjects: Current Affairs, Numerical Ability, Language, Literature. 5) Question Paper will be comprised of a total of 100 questions. 7) Each question carries 1 mark. TS LPCET 2018 Notification for HPT,TPT,UPT Admission Application Form, Eligibility, Dates, Pattern, Syllabus, Hall Tickets, Results, Rank Cards at tslpcet.cgg.gov.in.